J Smallz has been an active sound engineer and producer in South Africa for a bit now, but he is not well known in the US. That may change with his new single. A collaboration with South African Idols finalist Amy Jones, “Inferno” is a powerful R&B ballad that lights more than a few sparks. 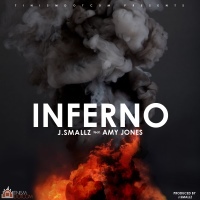 Check out J Smallz and Amy Jones on the hot single, “Inferno,” and tell us what you think!